It has not yet been confirmed if the enormous saltwater crocodile captured today was responsible for the death of a fisherman on Balabac Island on Wednesday. Photo courtesy of Rizzie Ancheta. Wildlife experts hunting for a saltwater crocodile that killed a fisherman in southern Palawan have captured a 15.6 foot long croc. It has not been confirmed whether the enormous reptile caught on Balabac Island today (Saturday, December 1) is the same croc that killed a fisherman on Wednesday. Either way, the apex predator will be moved to a crocodile sanctuary in Puerto Princesa following a spate of attacks on the island over recent months. 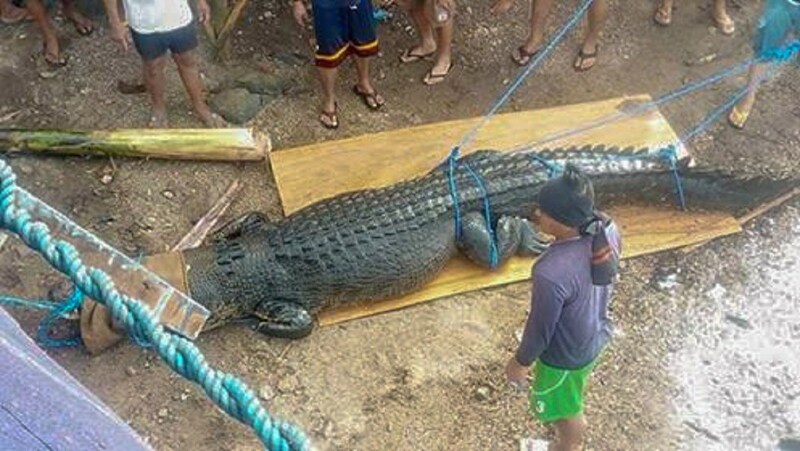 Jovic Fabello, a spokesman for the Palawan Council for Sustainable Development said the “Crocodylus porosus” specimen was estimated to weigh up to 500 kilograms. It was caught at about 2pm today by crocodile experts from the Palawan Wildlife Refuge and Rescue Center headed by Salvador Guion. Mr Fabello told Palawan News that they had not yet determined whether the crocodile is a male or a female. As we previously reported, fisherman Cornelio Bonete went missing last Wednesday after going to check on his boat and his body was found the next day. His right arm and left foot were severed and his body — which was covered in bite marks — was already beginning to decompose. Mr Fabello said the captured croc cannot be transported to Puerto Princesa City immediately, due to strong winds and waves. In the meantime, it is being kept in the custody of the local Coast Guard. Tomorrow, it will undergo a procedure called “gastric lavage” to determine the contents of its stomach and confirm whether it was the same creature that attacked Mr Bonete. The saltwater crocodile is the world’s largest living reptile. Males can grow up to 19ft in length, but reports exist of individuals measuring 23ft.